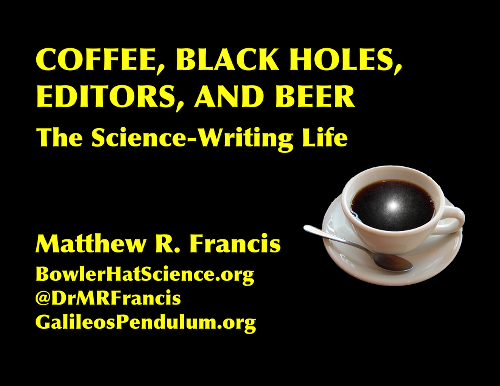 The title of my talk was “Coffee, black holes, editors, and beer: the science-writing life”. The list is in chronological order: coffee before anything else, writing (possibly about black holes), dealing with the business side of writing, and then coping with dealing with the business side of writing. I got my PhD from Rutgers University in 2005, under the supervision of Arthur Kosowsky, who is now at the University of Pittsburgh. Since I was ambivalent about the very long, drawn-out process of becoming a research professor, I applied both to postdoctoral jobs and teaching jobs, and ended up teaching full-time for six years. After that, a string of bad luck (including the closure of the college where I had been teaching) led me to think I should try to find something that would make me happier than moving every two years for the rest of my life. During my last year of teaching, I taught a class called “Science Vs. Pseudoscience”, aimed at non-science majors. My students had to write essays for the class, so I decided if they had to, I should have to write too. So, I started a blog — this blog, as a matter of fact. When my job ended, I ramped up my blog writing to build up a portfolio, which helped me land my first regular gig with Ars Technica. Since then, I’ve written for many different publications, and in the last two years I’ve been a full-time freelance writer. 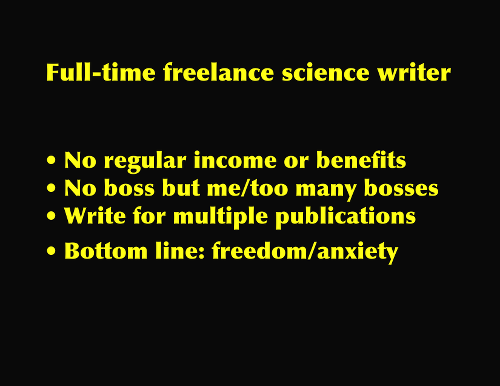 What is a freelance science writer? A mixture of freedom and anxiety. A freelance writer is someone who writes for one or more publications, but contributes one piece at a time, rather than be paid for full- or part-time work. In particular, when I write a piece, I am under contract to provide that article, and I’m paid for it. I’m not paid for my time, and I don’t get any benefits. I’m not allowed to say I’m an employee of (say) Symmetry Magazine, even if I’ve written a lot for them. That means I have a lot of freedom — I can largely pick and choose what I write — but also anxiety, since I don’t have any guarantee someone will pay me for it. Another aspect: I don’t have a boss, but each publication I write for has one or more editors I work with, who are kinda like mini-bosses. While my contact with each of them is fairly limited (I sometimes will talk to them on the phone, but most interactions are via email), they have a lot of control over what I say in my articles for their publication. So, editors can make a writer very happy, or make their life miserable — but it’s a limited amount of happiness and despair. I make all of my income from writing, but that’s not the case for many writers. 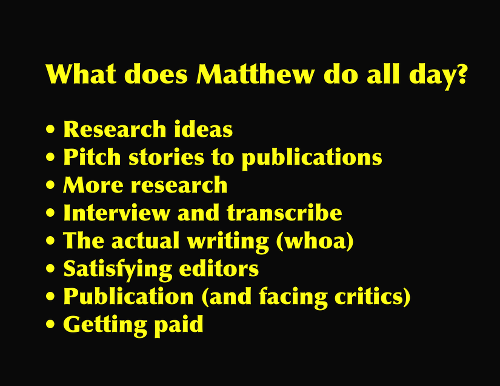 A lot of freelance writers have other jobs: teaching, part-time editing, fact-checking, retail, etc. Some have full-time jobs and freelance on the side. There isn’t one way to do it! I just happen to be a lucky person who can make a living off writing. I wrote 73 articles last year for 13 different publications, not counting blog posts, pieces I finished but were never published for whatever reason (thankfully a rare occurrence! ), and articles I wrote but still haven’t been published. 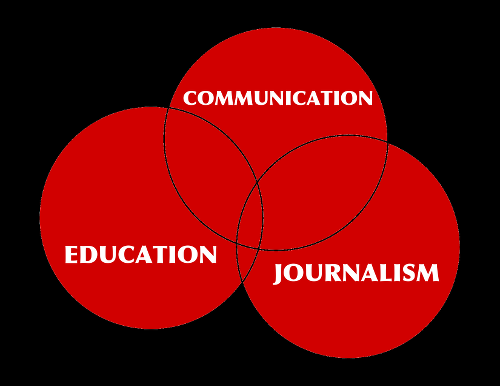 This Venn diagram is not to scale, but is simply intended to show that science education, “communication” (vaguely defined), and journalism aren’t exactly the same thing. Depending on the publication, they may want more or less of various aspects. One aspect of writing for publications of different sorts is that the nature of the content varies a lot. The big challenge for someone like me, who came from academia into writing, is learning that it’s not primarily about education. Sure, many articles have a little education in them — you’re explaining something that’s new to your readers — but most stories that’s a bit of vanilla added to the science cake, rather than the primary flavor. If you’re a blogger, you can get away with writing a 1500+ word piece explaining a bit of cool physics in detail, but it’s rare to find a publisher who will pay for such things. Science journalism is something that’s a little challenging for those of us who are inclined toward boosterism. Journalism demands that we get the story, including how we get stuff wrong. It’s not enough to tell how scientists do it, we should include how scientists fail as well. Journalism at its best keeps us honest. I do some journalism, but not all; for instance, I’m working extensively for Symmetry, which is a publication of Fermilab and SLAC, two particle physics labs. This publication is not particularly interested in my digging into the problems of various projects, or looking at issues in the culture of science. In other words, they don’t want journalism — and that’s not inherently a bad thing! It just shouldn’t be mistaken for critical analysis. Writing is only one part of what a freelance writer has to do. The rest is the business of working for yourself. Freelance writing is kind of like owning your own business. Remember how I said I don’t have a boss? It might be more accurate to say I’m my own boss. I have to track finances, my income and outgo, expenses, keep tabs on deadlines, and generally ensure there’s enough money to pay the bills every month. To write an article, I must first find a place willing to publish it. That means doing a bit of research to plot out what the article will contain, then writing up a “pitch” to an editor to convince them they should pay me to write the story. That process has gotten a lot easier: I’ve written for enough editors that I don’t have to introduce myself and my work nearly as much as I used to, but I still need to demonstrate that I have a coherent story in mind, not just a vague idea of “this would be cool”. This step can also involve negotiations over how much I will be paid, and generally is where we decide how long the piece will be. The writing itself is the most fun part of my job, but it’s not generally the part I spend the most time on. Partly that’s me: I’m a very fast writer. However, it’s like a lot of other business in that your job has many parts, not all of which are contained in the job title. When the writing is done, there’s the process of editing, revision, fact-checking, and so forth. This can involve rewriting, depending on whether my editors like what I said. Then the big day comes: publication. That’s when you learn if any small errors crept in (it’s amazing how easy it is to make grammatical or spelling errors when you’re so focused on getting the science right), because Some Guy on the Internet™ will notice and tell you he can’t trust a word you say because you accidentally put “their” instead of “they’re”, or similar. Or an expert in the field you’re writing about will chime in to tell you that you should have included some detail that only another expert would understand. And no matter how many nice things people say, the critics are the ones you’ll remember. It’s human nature. The final step is getting paid. Some places pay upon acceptance of the final draft, but most publications don’t pay until the piece appears in print or online. The annoying thing is when you have to ask to be paid. I have to do this too many times. 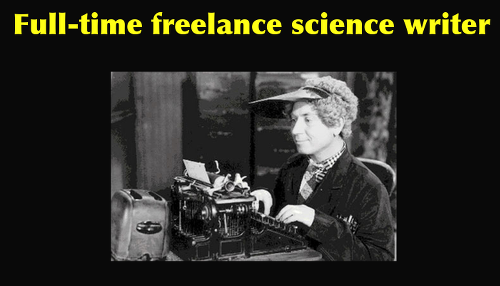 Scientists have advantages and disadvantages when they become freelance writers. You must unlearn some of what you have learned. Trained scientists have advantages and disadvantages when they want to write about science for the general public. 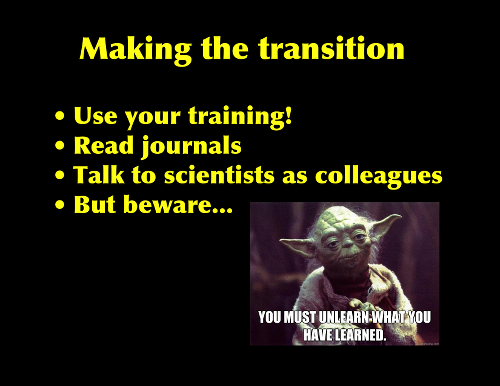 The big advantages are prior knowledge and the way we’re trained to think: we can understand the technical literature and talk to other scientists as peers. Even if I’m not conversant in all the jargon of (say) nuclear physics, I have a solid grounding in the concepts of physics, so I can generally get the gist of a paper. It’s also useful to be able to read the technical papers to figure out if the claims in a press release are as strong as they make themselves out to be: reading the methods and conclusions sections can be revealing. The disadvantages are that we’re trained to teach students to be scientists like us, but our readers aren’t our students. They don’t need to know enough to reproduce the work (the Roger Penrose Problem of putting waaaaay too much technical detail in): they just need enough to understand the story. The level of detail can vary, but typically you’re not going to be including nearly as much as you would in a piece aimed at budding scientists. 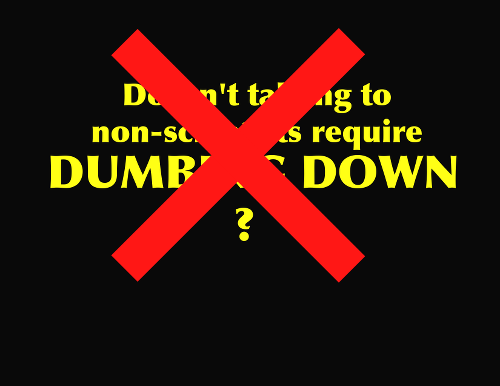 Expunge the phrase “dumbing down” from your vocabulary. But doesn’t that mean we have to “dumb it down”? NO. Let that phrase die a lonely death. Apart from the ableism of the insult “dumb”, if you go into a writing assignment thinking of your audience as deficient, you’ve already failed. Your audience isn’t stupid: they just don’t know everything you know. I know nothing about genetics, even though I’m very knowledgeable about physics and astronomy; a medical doctor may know nothing about black holes and read my articles to learn something about them. Is that doctor stupid? No. We are all amateurs outside our areas of specialization. Remember that, and share the love. And let’s face it: despite my best efforts, I screw up sometimes. The point is that when you screw up, own up to your mistakes and fix them when you can. If your errors are honest (rather than out of arrogance or laziness), they can be overcome. 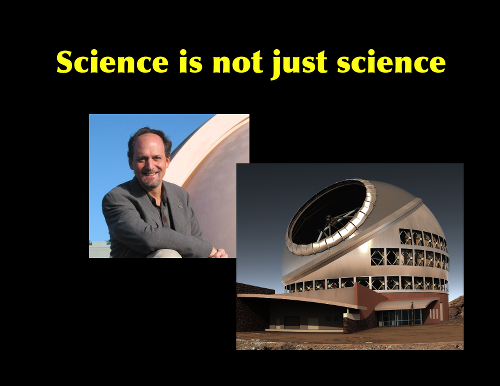 Geoff Marcy and the Thirty Meter Telescope: two instances where the misbehavior of scientists got in the way of the science…and hurt people. Sometimes the job is harder than others. Science isn’t just science: it’s all the times scientists behave badly too. Recently, a number of astronomers in prominent positions at universities have been outed as sexual harassers, protected by the academic system for the sake of their grant money and the prestige they bring. Never mind that this prestige comes at the cost of the damage to the careers of the women they harassed: the system protects the powerful at the expense of the ones the powerful people harm. Science writers have to come to terms with this, whether we like it or not. Similarly, when native Hawaiian groups pushed back against the construction of yet another telescope at the top of Mauna Kea, many within the astronomy community argued that the science is more important than their religious heritage. Some used very racist language. Astronomers often pride themselves as being fair-minded and egalitarian, but found themselves having to choose between doing the right thing by native groups (who have historically been marginalized by the dominant European-descended groups) and having a powerful telescope. I think we can get it right. The first thing to remember is that everything we write about is new to someone, and that’s exciting. You never know when a reader may be learning there’s a black hole at the center of the galaxy for the first time — and you’re the one to tell them about that. Science writing can help boost science itself, which can include fighting on behalf of those who are often left out. I love writing about science. While I don’t know if I’ll be a freelancer forever (I’d like to retire someday, maybe), I hope to keep writing about science as long as I can find someone to read what I produce. If you want to keep learning for life, writing is an opportunity to do that: you can learn something new literally with every new article you write. Don’t become a science writer if you want to become rich, or have a lot of spare time, or have lots of prestige and respect. (Sure, you might become rich, but odds are against it.) But if, like me, you love explaining science, love science itself, want to help make the scientific community a more equitable place…science writing may be for you. Arthur is one of a group of physicists who worked out the way cosmic inflation — the hypothetical rapid expansion in the very early universe — would show up in the cosmic microwave background. If that sounds familiar, it’s because that work hit all the major news last year when the BICEP2 research team announced they had seen exactly that effect. Things have become more ambiguous since then, but hopefully within the next year or two we should know better. The three categories here aren’t comprehensive of all the types of science writing, either. One thing I think of is public outreach for labs or universities, including press information office writing. Also, I’m focused on writing for text — print or online — rather than writing scripts for radio, podcasts, TV, videocasts, etc. I have no experience in those types of writing, so I can’t really talk about how they work very well. Fact-checking is awesome, though not every publication does it. Basically, someone goes over your article and makes sure you didn’t screw anything up, by talking to the people you interviewed, looking up references, and so forth. It can feel annoying (“don’t they TRUST me?”), but the end product is so much better and you can breathe more easily knowing someone has verified you didn’t mess up. Fact checking rocks. I failed to put a trigger warning into my talk, which I heard upset a few people. I apologize for that: it was thoughtless of me.